Stopping a dog from barking and jumping to put the leash on and go for a walk can be challenging with an energetic canine. Specially because people, unknowingly, do things that may exacerbate this problem. Dog bark and jump because they are so excited to go out on a walk that they can't control themselves. And, that is they key to the solution...teach your pooch how to control their impulses. To teach your canine friend self-control you can do several different exercises and in different environments. The more you practice, the better your dog will learn and respond. Practicing in different environments also helps your pet understand better and respond in many different situations. Never punish your dog for barking or jumping out of excitement, imagine a situation in which you are SO happy about something and start hugging people, then they start hitting you. It is better to use positive methods and keep your cheerful hound but with manners. Stopping a dog from barking and jumping usually requires a lot of patience and consistency from you. It is necessary to convey to your hound that to get the leash on and go for a walk he needs to calm down! The first thing you need to understand is that your pooch is simply too happy to stay still. Never punish this! Happiness and excitement are wonderful emotions, we just need to teach your furry friend to express them in a relaxed way. To teach your hound to be quiet and calm before going for a walk, you will do a kind of "dance" (which I like to call The Dance of the Dog Leash). If your dog is sitting you will get closer, slowly, to attach the leash, if he breaks the sit you will put the leash back in the rack and walk away! Make sure you completely ignore your hound while he jumps and barks. Turn around and do not make eye contact. Count to 10 and come back to try again. You will notice that during one training session, your hound will start to stay on a sitting position longer and longer as you approach with the leash. He might revert to jumping and barking the next day, this is normal...just keep training to stop a dog from barking and jumping once and for all. I recommend you start training The Dance of the Dog Leash on a day you have plenty of time. That way you can do several mini-training sessions. As you attach the leash successfully, take your hound for a short walk (i.e., around the block). When you are back home, wait 10 min and start again! That's it! very simple indeed…just be consistent and practice a lot. In no time your hound will stay still while you attached the leash! 1- When you feed your hound do not just put his bowl down freely. Ask for a sit-stay. You pooch should stay until his food bowl is all the way to the floor! The key is to do a "kind of dance". If your dog breaks the sit-stay, then stand up and put the bowl out of reach. Count to 5 and try again. Pretty soon he will figure out that to get his food he needs to stay put! 2- Teach your hound to ask for permission! This is one of the best things you can teach your canine friend. With lots of practice your pet will look at you calmly for permission. 3- Learn how to train a reliable dog command. This article outlines everything you need to know to teach your hound to respond to you even with distractions! 4- Teach your pet to "Settle" on command. This is very easy to do if you are consistent about rewarding your pet every time you see him relaxed. 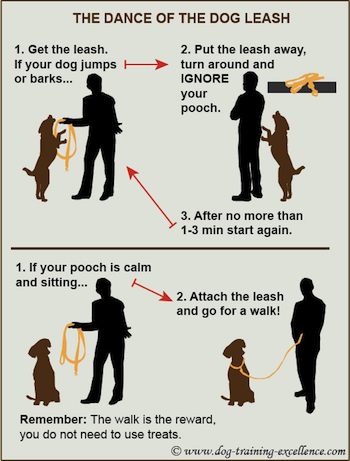 5- Play leash games with your dog to teach him to be calm during walks. 6- Pick the right leash for your dog. There are many types of collars and leashes, pick the right size and model depending on your type of pooch. There are also some that are easier to put on than others. Was stopping a dog from barking useful? have you tried other methods? Share them with us below!